"Sampath Speaking" - the thoughts of an Insurer from Thiruvallikkeni: Chennai Metro rail extends its outreach ! One common feature in every city is its bustling traffic – Chennai bustles at seams. The metropolis is growing rapidly and the traffic volumes on the roads have been increasing enormously. There is always need for effective means of communication – not all cities have extensive rail network – in Chennai – there is Beach-Tambaram line (which extends up to Thirumalpur); Central – Athipattu / Nandiambakkam, extending via Minjur, Ponneri, Gummidipoondi to Sulurpeta. Chennai Central – to Thiruvallur – Arakonam, Tiruttani.. .. and there is the MRTS from Chennai beach to Velacherry. The history is only a decade or so less than a century. Way back in 1930, the first consignment of 25 electric carriages from England came and Chennai (aka Madras) life changed thereafter. The first electrically operated rail service in Madras began on 2 April 1931 between Madras Beach and Tambaram, launched by Sir George Fredrick Stanley, the then Governor of Madras. The services became available to general public a month or so later. To meet the ever challenging increase of commuters in the city, a Special Purpose Vehicle (SPV) for implementing the Chennai Metro Rail Project was created. 2 corridors were proposed. The first one running from Washermanpet to Chennai airport through – Broadway, Central, Govt Estate, Spencers, Gemini, Saidapet, Guindy…… the other running from Chennai Central to St Thomas Mount through Vepery, KMC, Aminjikarai, Shenoynagar, Thirumangalam, Koyambedu, Vadapalani. The portions of Corridor-1 with a length of 14.3 kms. fromWashermanpet to Saidapet, and Corridor-2 with a length of 9.7 kms. from Chennai Central to Anna Nagar 2nd Avenue will be underground and the remainder elevated. 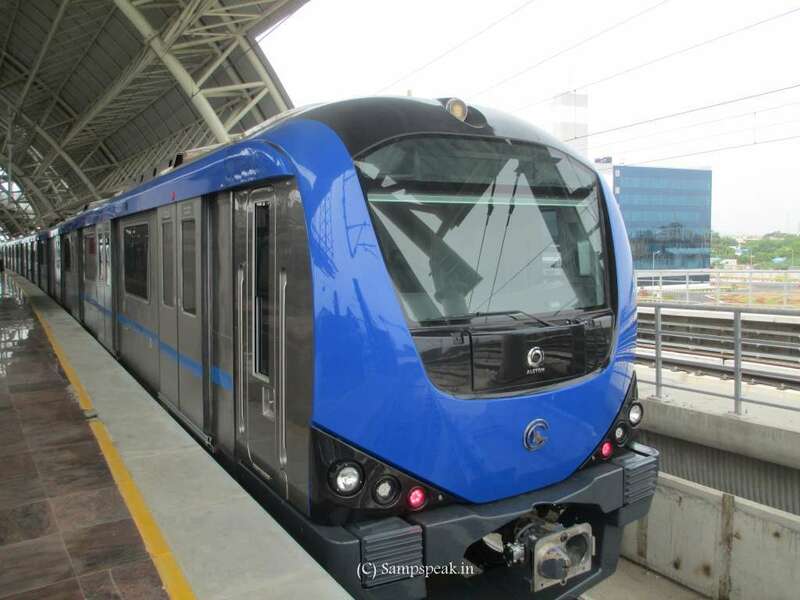 The attractive metro rail (the all air-conditioned train) is novel to Chennai, certainly not the first for the Nation. Calcutta was the first to possess one – in Mumbai, it is Govt-Private joint-initiative and in Delhi, there are so many lines : Red line; Yellow line; Blue Line and another Airport Metro Express line, which is more sophisticated. In Oct 2015, A distance of 10 Kilometers from Koyambedu to Alandur, the first phase of the much anticipated multi-crore Metro Rail chugged off with Chief Minister Ms.JJayalalithaa flagging off the inaugural service from the state secretariat through live video. The entire route is on an elevated structure covering a distance of 10.15 km, with stations at Alandur, Ekkathuthangal, Ashok Nagar, Vadapalani, Arumbakkam and Koyambedu besides the yard at the last stop. 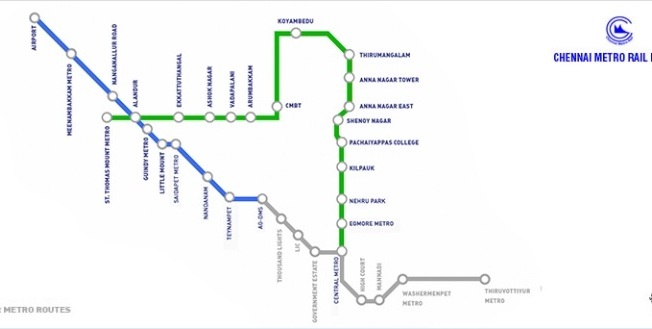 After six years of construction, Chennai Metro Rail Limited (CMRL) on May 25, 2018 opened two underground stretches — Nehru Park to Chennai Central and Saidapet to AG-DMS. Chief Minister Edappadi K Palaniswami and Union Minister Hardeep Singh Puri inaugurated the stretches from the Chennai Egmore Metro Rail station on Friday. These two are the fourth and fifth stretches to be opened in the network. The maximum fare has now been increased to ₹70; the minimum is ₹10. A commuter who wants to travel from Chennai Central to Chennai airport or AG-DMS to Chennai airport will have to pay ₹70. There has always been the need for a new rail based rapid transport system and towards this objective the Government of Tamil Nadu have decided to implement the Chennai Metro Rail Project. This project aims at providing the people of Chennai with a fast, reliable, convenient, efficient, modern and economical mode of public transport, which is properly integrated with other forms of public and private transport including buses, sub-urban trains and MRTS. The Government of Tamil Nadu approved this scheme in principle – schemed to be two initial corridors in Nov 2007. Now life has come a long way as Chennai Metro services no connect four major transport hubs in the city — Central, Egmore, the CMBT and the airport. At the launch function, Chief Minister Edappadi K. Palaniswami said the government planned to extend the Metro Rail from the airport to the proposed express bus terminus in Vandalur (through the southern suburbs) and tweak the alignment in the next phase to take the Metro to Poonamalee on the city’s western outskirts via Porur. The Chief Minister announced that a feasibility study would be taken up to explore the possibility of extending the Metro. Unlike MRTS which has lesser frequency – the Metro has a smaller capacity but increased frequency. To me, for the cosy comfort that the metro rail offers, the fare is reasonably priced as one would spend much more for travelling lesser distance in an auto-rickshaw. Reports suggest that the Chennai metro witnessed a huge crowd on Friday with the inauguration of six metro stations along Nehru Park to Central and Saidapet to AG-DMS stretches. ~ ~ and media reports suggest that the rides are free for 3 days !! - really do not understand this .. where was the need and what are the authorities trying to invite ? ~ ludicrous it sounds !! ~ The economic theory is that whatever goods and services are provided, they must be paid for by someone - that is, you don't get something for nothing. The phrase is also known by the acronym of 'there ain't no such thing as a free lunch' ! !